Bring a little Vegas flair to your next poker night or party with the Playing Card Dealer Shoe by Trademark Poker. 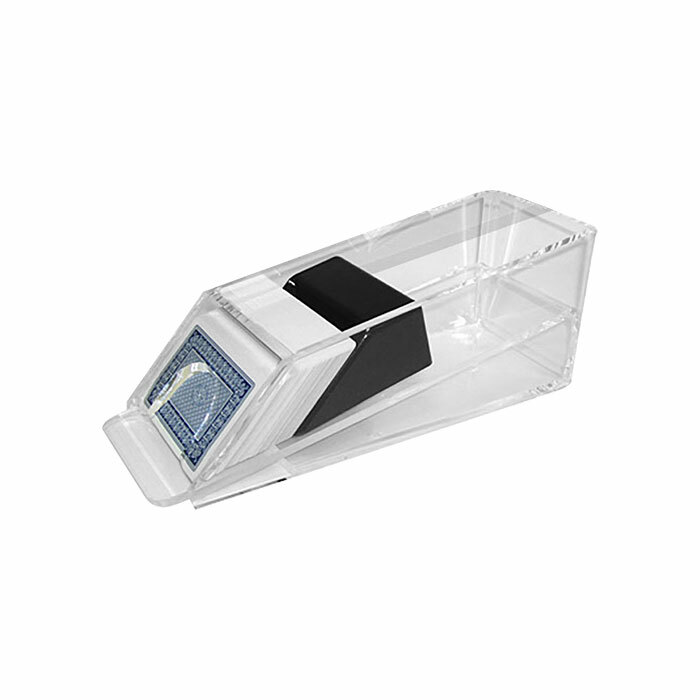 This professional quality card dealer is made of clear acrylic to be durable and prevent cheating. It can hold up to four decks of standard sized playing cards, so you and your friends can play blackjack, poker or other card games as long as you like without running out of cards. The dispenser has a weighted steel wedge to automatically feed the cards for smooth and efficient dealing and card play. Whether you’re a serious player or just looking to bring a little casino style to your next game, this dealer is sure to be a great addition to your game room. CASINO QUALITY- The body of the blackjack shoe is made of thick clear acrylic and is the same size and style of dispensers used in casinos. The edges are rounded and smoothed to prevent chipping, prolonging the life of your dispenser and preserving the handsomeness of your game room. PRODUCT DETAILS- Materials: Acrylic and Steel. Dimensions: 11” L x 4.5” W x 4.1” H. Four Deck Capacity.